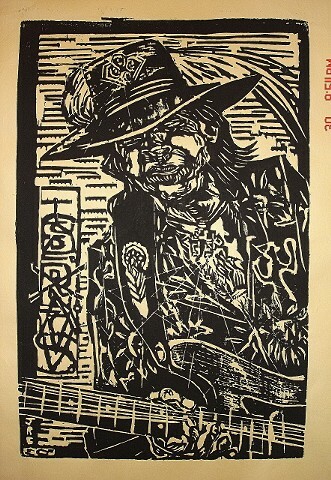 I have to say, I hadn't given Stevie Ray Vaughn much thought until I was asked to do this piece as a commission. As I started checking out images and the music, I found I had a lot to work with. With the flashy "Hendrix-as-Gypsy-Cowboy" look, a beat--up guitar, and with strings fatter than snakes, he wrestled one hell of a howl and looked good doing it.